AM General CORP. M36A2 Military 2 1/2 Ton Cargo Truck form 1973 dated US Government Contract with 18’ cargo bed and drop sides for pallet loading and unloading. 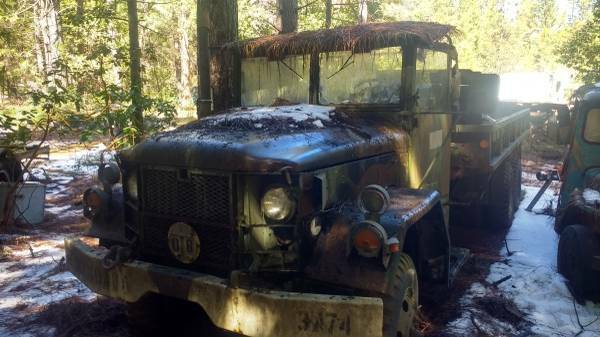 In excellent original military condition including camouflage paint, 24 volt electrical system, and multi-fuel turbo 6 cylinder engine. Very low miles and hours (see photo). Outstanding 900x20 NDCC tires with spare off of it’s bracket in the bed of the truck (see photos). Purchased from a military surplus dealer who had just purchased it from the US Government. Was found to be operational after delivery, and then driven to it’s present location and parked with covers over both the exhaust outlet and the cab for storage.